His Campaign is still active and you can donate here. Remember when you were little and got your first pet as a present? Or maybe as an adult, you moved into a new apartment on your own, and decided to get a furry companion? It could also be true that you were never allowed to have any pets, but always had a genuine compassion for animals, and so you volunteered at a local animal shelter from time to time. Whatever the case may be, at some point in your life, you or someone you know, have sacrificed space, time and money to aid an animal and assure that it lives a comfortable and safe life. However, considering that heavy responsibility that comes with caring for animals, would you still be able to make that same sacrifice, if it was at the risk of your life? In unexpected and unforeseen circumstances, we often find ourselves in situations that challenge our views of life. If we’re lucky, though, the experience reveals a calling within us that gives life new meaning and exposes a raw, honest love for all creatures in need. Meet Naoto Matsumura, the Guardian of Fukushima, who, with big-heartedness, has dedicated his life to save and care for the lives of hundreds of animals, while endangering his own in the process. In 2011, when the Tōhoku earthquake and tsunami hit Japan, it caused the Fukushima Daiichi power plant to leak radiation. This caused thousands of citizens to evacuate Japan’s Fukushima prefecture area, including Matsumura. Initially, fleeing south due to radiation contamination concerns, Matsumura eventually decided to return to his family’s farm in the small town of Tomioka, merely because he could not abandon the animals on his farm. Upon return, left in the town were only abandoned streets and houses filled with the pets and livestock who were left behind. 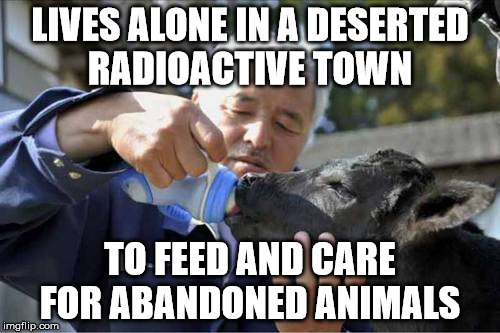 Matsumura began feeding the starving animals and eventually decided he should stay and care for the animals that survived, even though it was a direct disregard of government orders because the area was extremely contaminated, deemed unsafe, and unlivable. Naoto Matsumura made a choice that not too many people can say they have, or ever would. By choosing to stay in Tomioka, Matsumura was being exposed to up to 17 times the level of radiation that is considered safe. 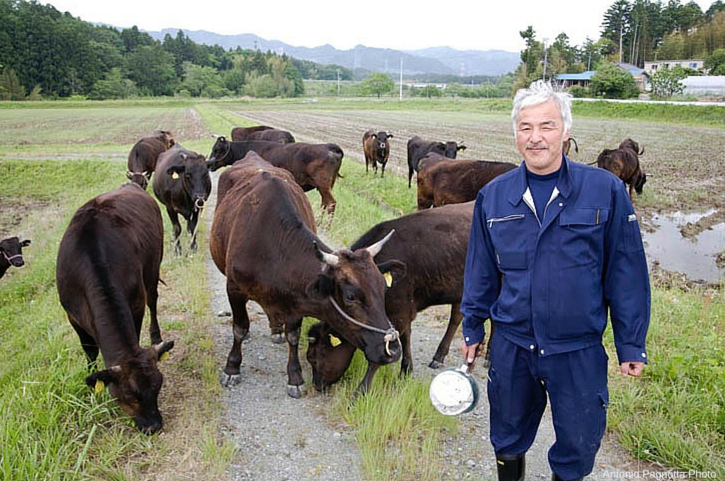 The animals of Fukushima that he cares and tends to include: dogs, cats, cows, ducks, ostrich, pigs, and even a pony. It’s important to recognize Matsumura’s selflessness and show the power of relationships that can form between a person and animals. So the next time you’re not sure whether or not you should get a pet, or on the edge of whether to volunteer your time at an animal shelter, remember that whatever sacrifice you make to put an animal’s needs ahead of your own is undoubtedly the purest form of self-reward and love. I am a cancer survivor, for some reason I do not see your sign up form. Please let me know how to suscribe. Need help. Send me a link.